a) Korres store in Singapore is currently under renovation (at least, that's what I think), so I can't get their famous lip butters. b) Just when I wanted coffee, Angel In Us (a coffee shop) is ALSO under renovation. c) My nose has been very stuffy since Sunday and I have to breathe through my mouth to keep myself alive. Geez. d) I left my novel at my workplace because I was already drowsy from the meds. Darn it! H-o-w-e-v-e-r, as they always say, there will be sunshine after the rain, silver linings to every thing, and blah blah. Well, it's true. I got home and was astonished to see a huge box in front of my room. My brother immediately said, "I know that box. It's from AmiAmi." I opened the box in such a haste that I nearly cut myself in the process. It certainly did make me feel tons happier when I see them. Oh, I also went to Watsons just for the sake of it. 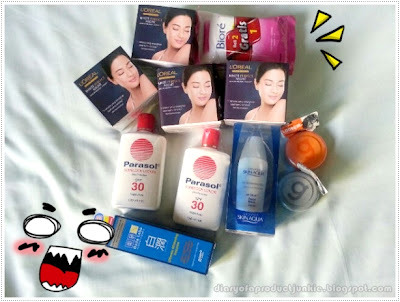 Gyahahaha.. Those four L'Oreal Night Creams aren't for me, btw.